Network Marketing is being taught in more than 200 colleges including Harvard Business School. marketing companies that fail do so in the first 18 months. 2. The company should have a product which is unique and highly consumable, unique in this case means that you have an exclusive product that can only be purchased from your company’s distributors. Having a product that is highly consumable means repeated sales, thereby guaranteeing customers loyalty versus a one time sale and having to locate new customers. 3. It needs to be a "ground floor" opportunity. Harvard Business School suggests that in order for the opportunity to qualify as "ground floor" the number of existing active distributors should be less than ½ of 1% of the population (300 million in the United States) in the country where this network marketing company exists. In the United States this figure is equal to 1.5 million people. Harvard Business School also stated that if there were less than 500,000 people involved, you would be on the cutting edge of a great opportunity!!! If the company has less than 100,000 distributors, Harvard Business School considers it to be a once in a lifetime opportunity! This usually lasts 6 months. This is the period when a company develops its product and marketing plan. This period lasts from 2 to 4 years when distributor network is started. This period lasts 2 to 4 years also. This is when the company experiences phenomenal growth. Both retail and distributorship explode in terms of expanding growth. It is during this period that a company virtually sweeps across the nation. When a company’s sales reach $50 million annually, they reach what is called "critical mass", (sales go vertical right off the graph). Also, approximately 2/3 of the company’s growth of new distributors occurs during this period. When "Herbalife" reached 50 million in retail sales, they jumped to 151 million in retail sales in only 12 months. They also added over 800,000 to their organization. Let us assume you have an organization which is producing an override bonus check to you of $1,000 per month. When the company reaches "critical mass", distributors automatically experience a ten fold increase in their earnings. In other words, $1,000 per month becomes $10,000 per month. This is the reason for getting involved on the "ground floor" so you will experience the benefits of explosion growth. This period lasts for the life of the company. A network marketing company that is dedicated to the success of its distributors will experience longevity, thereby ensuring that an active distributor will realize continued earnings and growth. Why is LifeVantage a Once in a Lifetime Opportunity? where 80% of all commissions are paid out over the life of the business. We are in the pioneering or concentration stage of the company with less than 50,000 distributors worldwide in only 4 countries, with more international expansion being planned! We have reached an average of 300% growth per year in the past 3 years! We are in the DSA Global 100: The Top Direct Selling Companies in the World in less than 3 years! We are one of the top fastest growing publicly traded network marketing company in the world! Our sales went from $3.5million in 2009, to $11.5 million in 2010, to $38.9 million in 2011, to over $125 million in 2012!!!! We have a unique consumable product backed by science with 4 patents, 9 peer-reviewed independent studies and 20 undergoing independent studies! We have a 90% retention rate. 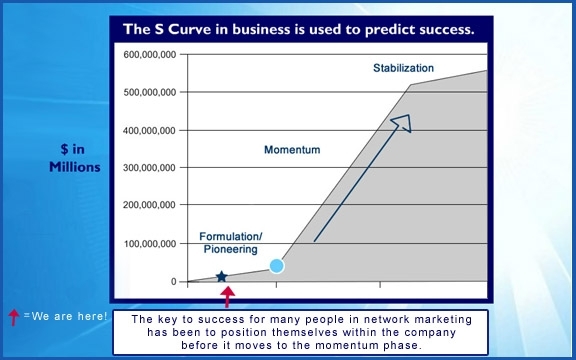 We are the only company in the history of network marketing to have that kind of reorder rate. We have a higher ratio of customers than distributors. We have most of our purchases coming from our customers than distributors! That is a great sign that the product works!!!!! The Anti-aging industry is growing from $80 billion to $115 billion per year by 2015 (Global Industry Analysts, August 2011). We have a cutting edge scientific breakthrough. A product that is truly changing people's lives and it is only being sold exclusively through independent distributors. And you are being given the chance to become one!!!!! We have a product that is clinically proven to reduce oxidative stress by 40-70% in every mammal, working 100% of the time. This window of opportunity gets smaller and smaller everyday. Timing is everything in this business! to stick with your "40/50 Plan"? and most compensated project of your life? someone will hire you to build theirs!" Let's make a living while making a difference! Call me today and join the LifeVantage family now! Not sure yet, watch Robert Kiyosaki explains the Perfect Business of the 21st Century!